Cosmic Rays and tree growth patterns linked | Watts Up With That? Here’s a surprise. The growth of trees in Britain appears to correlate to cosmic ray intensity. University of Edinburgh researchers have found that trees are growing faster when high levels of cosmic radiation arrive from space. This may also correlate to the Interplanetary Magnetic Field which tends to modulate Galactic Cosmic Rays. The discover lends credence to Svensmark’s work on GCR to cloud cover correlation by demonstrating yet another tangible effect. The researchers made the discovery studying how growth rings of spruce trees changed over the past half a century. Here’s the kicker: the variation in cosmic rays affected the tree growth more than changes in temperature or precipitation. The study is published in the scientific journal New Phytologist. Abstract below. “We were originally interested in a different topic, the climatological factors influencing forest growth,” says Ms Sigrid Dengel a postgraduate researcher at the Institute of Atmospheric and Environmental Science at the University of Edinburgh. To do this, Ms Dengel and University of Edinburgh colleagues Mr Dominik Aeby and Professor John Grace obtained slices of spruce tree trunks. These had been freshly-felled from the Forest of Ae in Dumfriesshire, Scotland, by Forest Research, the research branch of the UK’s Forestry Commission. The trees had been planted in 1953 and felled in 2006. The researchers froze the trunk slices, to prevent the wood shrinking, then scanned them on to a computer and used software to count the number and width of the growth rings. As the trees aged, they showed a usual decline in growth. October 19, 2009 in Paleoclimatology, Space. Just the hint of a Climate Change negative at the end of the BBC piece. Seems wherever we look the sun influences the biosphere and the climate, with some even suggesting influences on volcanic and seismic activity. Of course if your from RC, then the sun only effects the earth through changing TSI – yeah right! Another example of expanding uncertainty – the more we learn about the climate the less we know! But, but, but it’s almost as if CO2 isn’t as overwhelmingly important as we’ve been led to believe. a) the study was undertaken and the scientists actually looked beyond their indoctrinal noses to test for the correlation that must not be named. b) the BBC published this story. Maybe the Beeb is carefully repositioning itself as a news agency, and it was just reporting the news previoyusly. Now there is new news and it is also reporting it. Perhaps the Solar dam will burst and drown the AGWERs. You guys have it all backwards. Its obvious that tree growth actually influences Cosmic rays. Its at least as obvious as Tiljander varves and CO2 in the Vostok ice cores. May I throw in another piece of the puzzle? Odd. I thought they’d grow more when the cosmic rays are lower. The UK is a climate anomaly. Maybe the wet compensates for the cold. Very interesting, although I’m slightly confused. Are they saying that it is not the extra rain that would result from extra cloud formation caused by GCRs, but the actual GCRs themselves? Either way, if confirmed, this has got to be yet another nail in the Hockey Stick’s coffin. Much more of this and we’ll need a second lid for it. meemoe_uk, I thought the same thing as soon as I read it. Wouldn’t Svensmark’s work suggest cooler temps during periods of high cosmic rays which should result it slower growth? Can anyone shed light on it. Interesting. Based on this study you linked, and the Swiss study mentioned in that, and the fact that both found the temperature anomaly was throughout the forest canopy; we could extrapolate, that widespread deforestation, especially in the tropics, could significantly impact global temperatures. Has anyone said, “It’s the sun, stupid.”, yet??? That being said, if there was some truth to this , how would one interpret the RAW tree ring records that were used in the hockey stick & other paleo-climate reconstructions. Any support / correlation there for this hypothesis? Maybe the particles get rid of pests like I hope the coming cold will do. We are winning, not that I ever really wanted to play this game, but whatever. This is interesting but counterintuitive. According to the Svensmark theory (I’m not convinced either way on it), the Little Ice Age presumably was cold because the sun was inactive (almost no sunspots for 70 years), and this inactivity allowed more cosmic rays and thus more clouds and a cooler earth. Yet tree ring records show reduced growth during this cold period (unless you are Michael Mann and colleagues). The evidence provided in today’s article suggests that when the sun is cooler (at least within the context of recent 11 year cycles), trees grow more, not less, as in the LIA. Perhaps the difference is that if we had 70 years of very low solar activity, perhaps trees might grow well at the beginning of the cycle, when things were still relatively warm, but if a cooler sun really meant a genuinely cooler world with less heat and shorter growing seasons, then even with the kind of connection demonstrated in this article, you would still get less growth with less cosmic rays. Not sure how to put the LIA and today’s growth possibilities in context…. Wow. If we can see the influence of GCRs in tree rings, where else have they left their mark? Annual growth rings, measured along the north radius of freshly cut (frozen) tree discs and climatological data recorded at an adjacent site were used in the study. I find climate data from an adjacent site much more persuasive than Mann, et al’s comparisons with climate data from distant sites processed through a climate model. The BBC report has only a weak attempt to blame AGW, in the form of aerosols and not GHGs. The discovery was by accident. They didn’t set out to look for a cosmic ray connection, ie it wasn’t in their funding request or terms. It is brave of them to publish these results and I hope it doesn’t harm their future funding. However, with reference to my next point, I fear they have committed career suicide. Correlations were based on Pearson product–moment correlation coefficients between the annual growth anomaly and these climatic and atmospheric factors. # Rather weak correlations between these variables and growth were found. This single result, if confirmed/replicated, invalidates all the work of the Mann school of dendroclimatology and of course the Hockey Stick. A possible explanation for the extra growth during high comic rays is that if Svensmark is right you would get more cloud cover which would mean warmer nights, most plants do most of their growing at night. I have measured Hop plants growing up to a foot in one night when it was warm and thundery. He talks about the AO and NAO turning positive which will lead to that warmth. However, NOAA’s website is showing prediction of another sharp downturn in the AO and the NAO being predicted to just barely turn positive and then turning negative again or stay positive. Which trees grow faster with more cosmic rays and which grow slower? To assume that all trees will follow the same rule is to stop looking. And what about other flora? It’s a good find, though. Keep going. This is typical rookie postgraduate mistake. By objectively looking for a natural correlation she is now left with one she can’t explain. She should have first pre-filtered here data to a foregone conclusion that she had a plausible explanation for. Then the story would have been a lot neater and tidier and could be accepted by the wider scientific community. Poor girl, she probably still believes in the ideals of Einstein and Popper. I thought the same thing as soon as I read it. Wouldn’t Svensmark’s work suggest cooler temps during periods of high cosmic rays which should result it slower growth? Can anyone shed light on it. Ms Dengel’s team proposes two main hypotheses as to how cosmic ray particles could influence the growth of trees. The first idea is that cosmic rays ionise gases in the atmosphere, creating molecules around which clouds condense, therefore increasing cloud over. This mechanism is hotly debated among scientists, and evidence for it is weak. One study published in 2006 suggested it may account for as little as 2% of the variation in cloud cover across the UK. But if it does occur, then an increase in cloud cover and haze would diffuse the amount of solar radiation reaching the trees. As diffuse radiation penetrates forest canopies better than direct light, it would increase the amount of radiation that plants capture, and increase photosynthesis by trees, boosting growth. “Or there is some direct effect,” says Ms Dengel. What that might be is unknown, but experiments in space have shown that cosmic rays can have some positive impacts on biological materials. I’d add that there is a great deal of evidence that physical processes like radiation and magnetism directly affect biological processes, mostly positively (ie organisms grow faster), although why this happens is something of a mystery. my understanding of tree growth (which is limited) is that growth is constrained mostly by availability of water. Which (to me) would imply that cosmic rays are modulating rainfall, which has been reported in a number of other studies. The argument used that diffuse sunlight reaches more leaves and produces more growth seems tenuous and not at all robust. Might the diffuse sunlight be from clouds that produce rain and, as mentioned before, warmer nights ? Just a thought re why trees might exibit more growth during cooler, high GCR, and likely more cloudy periods could be due to the nightime insulating effect of cloud cover. The days might be cooler, but the nightime less so. I find that it’s the cooling nights of autumn that shuts down growth at the end of each year rather than the cooling daytime temp. Another possible explanation for extra growth during high cosmic ray intervals is that the ultimate result of high cosmic rays is to dehumidify the atmosphere. So an increase in cosmic rays will result at first in an increase in cloud cover but later, as the liquid water rains out, leaves decreased water in the atmosphere resulting in decreased greenhouse effect and cooler temperatures, but perhaps more sunlight due to cloud cover declining to a lower level than before. This assumes of course that cloud cover varies with absolute humidity which I think is a safe assumption. We have had a cooler/wetter spring/summer in Col, Oh USA this year. I have had to cut our lawn more often than during hotter/dryer spring/summer. Is it do to cosmic rays, sun spots, moon orbit, earth tilt or a combination of a lot of “things”? The increased plant growth from diffuse sunlight is well accepted and uncontroversial. FYI is a link to a text on growing grapes that refers to the effect. Google will give you many more. The study found that tree growth changes from changes in temperature and precipitation were so small as to be almost non-existent. Which means the GCR effect is NOT through temperature or precipitation changes. Radiation hormesis is a classic example of an ‘incorrect’ concept that has to be rejected for regulatory reasons. However, T. D. Luckey found plenty of literature support for his monograph of 1991. There is a link in the Wikipedia article to a 20 page overview (.pdf file) by Luckey. Seems wherever we look the sun influences the biosphere and the climate, with some even suggesting influences on volcanic and seismic activity”. Keep that thoughts stumpy and forget about the rest you wrote. We are getting there slowly but surely. Hmmmm…. novice observation here. If during high GCR there is greater tree growth, would this sequester abnormally large amounts of CO2? If this is so, then would that exacerbate the down-turn in temperature? And if that is true, once some sort of bottom temperature is reached does the biological matter die, releasing the abnormally large amounts of CO2, causing a temperature rebound? Dengel, S.; Aeby, D; & Grace, J. (2009). A relationship between galactic cosmic radiation and tree rings. New Phytologist 184(3), 545-551. doi:10.1111/j.1469-8137.2009.03026.x. Again we are reminded to listen to Currie. We must overcome the resistance to studying & commenting on things that are not well-understood. Open discourse should not be derided & oppressed. Anthony, thank you for running this story — this is an important clue. Gu, L., D. Baldocchi, S. B. Verma, T. A. Black, T. Vesala, E. M. Falge, and P. R. Dowty (2002), Advantages of diffuse radiation for terrestrial ecosystem productivity, J. Geophys. Res., 107(D6), 4050, doi:10.1029/2001JD001242. Clouds and aerosols alter the proportion of diffuse radiation in global solar radiation reaching the Earth’s surface. It is known that diffuse and direct beam radiation differ in the way they transfer through plant canopies and affect the summation of nonlinear processes like photosynthesis differently than what would occur at the leaf scale. We compared the relative efficiencies of canopy photosynthesis to diffuse and direct photosynthetically active radiation (PAR) for a Scots pine forest, an aspen forest, a mixed deciduous forest, a tallgrass prairie and a winter wheat crop. The comparison was based on the seasonal patterns of the parameters that define the canopy photosynthetic responses to diffuse PAR and those that define the responses to direct PAR. These parameters were inferred from half-hourly tower CO2 flux measurements. We found that: (1) diffuse radiation results in higher light use efficiencies by plant canopies; (2) diffuse radiation has much less tendency to cause canopy photosynthetic saturation; (3) the advantages of diffuse radiation over direct radiation increase with radiation level; (4) temperature as well as vapor pressure deficit can cause different responses in diffuse and direct canopy photosynthesis, indicating that their impacts on terrestrial ecosystem carbon assimilation may depend on radiation regimes and thus sky conditions. These findings call for different treatments of diffuse and direct radiation in models of global primary production, and studies of the roles of clouds and aerosols in global carbon cycle. Still, C. J., et al. (2009), Influence of clouds and diffuse radiation on ecosystem-atmosphere CO2 and CO18O exchanges, J. Geophys. Res., 114, G01018, doi:10.1029/2007JG000675. This study evaluates the potential impact of clouds on ecosystem CO2 and CO2 isotope fluxes (“isofluxes”) in two contrasting ecosystems (a broadleaf deciduous forest and a C4 grassland) in a region for which cloud cover, meteorological, and isotope data are available for driving the isotope-enabled land surface model (ISOLSM). Our model results indicate a large impact of clouds on ecosystem CO2 fluxes and isofluxes. Despite lower irradiance on partly cloudy and cloudy days, predicted forest canopy photosynthesis was substantially higher than on clear, sunny days, and the highest carbon uptake was achieved on the cloudiest day. This effect was driven by a large increase in light-limited shade leaf photosynthesis following an increase in the diffuse fraction of irradiance. Photosynthetic isofluxes, by contrast, were largest on partly cloudy days, as leaf water isotopic composition was only slightly depleted and photosynthesis was enhanced, as compared to adjacent clear-sky days. On the cloudiest day, the forest exhibited intermediate isofluxes: although photosynthesis was highest on this day, leaf-to-atmosphere isofluxes were reduced from a feedback of transpiration on canopy relative humidity and leaf water. Photosynthesis and isofluxes were both reduced in the C4 grass canopy with increasing cloud cover and diffuse fraction as a result of near-constant light limitation of photosynthesis. These results suggest that some of the unexplained variation in global mean δ 18O of CO2 may be driven by large-scale changes in clouds and aerosols and their impacts on diffuse radiation, photosynthesis, and relative humidity. I wonder how many times these trees were struck by ice storms? Here in the Ozarks, stricken by the horrible January ice storm, the trees have grown faster than I’ve ever seen trees grow this summer. Much faster than last summer… lots of precip both years. The trees appeared to be boosting energy in repairing damage and sprouting new limbs to replace lost limbs. They produced little or no acorns or hickory nuts. “I recall another paper that found base flows in very large river basins also responded to GCR, possibly due to changes in rainfall and evaporation transpiration. This study would indicate transpiration (from increased plant growth) is the main cause. As I said, a very interesting study that will rattle more than a few cages. I wonder how many times these trees were struck by ice storms? Here in the Ozarks, stricken by the horrible January ice storm, the trees have grown faster than I’ve ever seen trees grow this summer. Much faster than last summer… lots of precip both years. The trees appeared to be boosting energy in repairing damage and sprouting new limbs to replace lost limbs. They produced little or no acorns, pine cones or hickory nuts. Dan Lee (18:14:33) : Wow. If we can see the influence of GCRs in tree rings, where else have they left their mark? Oh, I don’t know… maybe in the thicker fur on my cats and rabbits, my stiffer hair the last year or three, my desire to migrate has returned (had it in the ’60s and ’70s then it went away for a while… but the wanderlust has returned…) and in the early migration of birds, whales, et. al. reported here. “[…] in a study of 305 tree-ring chronologies from North America, periods of 18.6 yr and 10.5 yr were found in 286 and 244 instances (Currie, 1991), respectively. I think I’d like to read that paper. Tomorrow I’ll see if I find a freebie. Plants hate extremes. Heat stresses. Cold stresses. Trees have Deep roots. A drier than normal summer probably wouldn’t affect a tree as much as, say, a corn stalk. Several in a row, might. I vote for warm, and cloudy over hot, and sunny. More CRs more cloud more rain wetter soil more nutrient uptake more tree growth? Tie that to Australian folklore: 1. Following a dust storm the number of people in the general area catching diseases drops significantly. 2. Following three nights of frosts… ditto. Below is a readable description of how plant growth has been increasing on a global basis based on satellite measurements. Clearly, carbon dioxide fertilization couldn’t be solely responsible for the change; climate change must be playing a role as well. Note how variable this greening (called NPP) is, from the following graph. Nothing like the straight line increase in CO2. I wonder what the correlation to GCRs is? The hypothesis they propose is that as more clouds diffuse the sunlight the amount of photosynthesis is increased. I presume they’re suggesting that photo-inhibition is caused by excess sunlight when clouds are scarcer and this translates to reduced wood production (narrower rings). Sounds plausible, but needs some data on Sitka spruce physiology not mentioned in the abstract. Interesting. They didn’t find good correlations with precipitation, but we should think about how cloud cover affects soil-moisture-retention (during day & night – & seasonally, etc.). Sorry Eddie, increased growth is likely to be due to increased light getting through the canopy now that lots of older branches have fallen off. And we don’t get ice storms in the UK or even Scandinavia for some reason (can anyone tell me why?). My wife (from Noway) and I have found the freezing rain and ice storms in the North East of North America very unusual since we have been here. This correlation is very interesting though. I think people killed off the global temperature relationship with tree rings a while ago (unless you are Mann et al…. ), but replacing it with global GCR might not be easy. Rainfall, temperature and incident light are all very localised (walk through many medium age forests and see how dominant tree species change with aspect, elevation soil etc.) so although there is good correlation here with a nice data set, it is – by its very nature – anecdotal. Valuable is the reference to another paper noted by a Paul Vaughan (19:35:14) above. This suggests that there may actually be more of this type of carefully collected data out there from which we my be able to draw some more general conclusions. I take it the dendroclimatologists will be revising all their conclusions then? Do you think the cosmic ray/tree study will make it in Canada? Any papers on IPCC bias by Pielke Sr.? An interview of Steve McIntyre? A good discussion on tree ring growth effectors. Benifical growth conditions, moisture in air as well as in soil, warmth at night as well as day. Hot days and direct sunlight cause stress as well as do cold nights. Greater stress means less growth, narrower rings. Also less stress gives more uniform growth rings around the tree. I am running a small lab plant growth test at present and am finding better growth in high humidity air , very near saturation, rather then in 40-50% humidity, all other factors being equal. With over 40 years of growing field crops I can tell you that warm damp nights yield the best plant growth, with most plants night temperatures lower then 50 degrees F will negate all of the previous days growth. I hope this helps with the evaluation of tree ring data. I had a look at that link,they say “diffuse sunlight is often as photosynthetically active as direct sunlight. They refer to a Table 5.3 above the comment that ,but for UV,shows the opposite,that is in the most leaf absorbent light region (Blue/Green 400-500nm) gathers more light energy from direct light. I have 80 Ha of grapes growing behind my house and I suspect that the humidity that accompanies ‘diffuse’ light is the important factor. That is I think that growth is optimal when transpiration takes place with optimum humidity otherwise the plant restricts growth to avoid water loss through the leaves. I wonder how many times these trees were struck by ice storms? Almost certainly never. Ice storms of the type N America experiences are very rare to non-existent in the UK. And we don’t get ice storms in the UK or even Scandinavia for some reason (can anyone tell me why?). N. American ice storms occur when warm rain bearing air moves over an area previously occupied by very cold air. Rain falls onto the ground which is still well below zero and often the layer of air immediately above the ground is also well below zero. So the rain arrives either as ice pellets or (the worse kind of ice storm) the rain freezes on contact with the ground and anything on the ground, forming a thick layer of ice. The UK never gets a sufficient temperature difference between the warm and cold air. Although I recall from my childhood in the UK, slight short lived ice accumulation in the right circumstances. I plead guilty to picking a link to illustrate my point without really reading it. I’d add that the main effect of diffuse sunlight is that it comes from many directions and so penetrates canopy forest especially much better than direct sunlight and hence more leaves get sunlight. I’d expect a similar effect with most plants that don’t hug the ground. Who would have thunk it? Put that In Your Funk and Wagnalls! Huh, so tree rings can possibly used for studying climate change after all. Though from a different angle than previous methods. But I’ll wait for the other shoe to drop that says they still are unreliable. This is also my view. There have been similar tendencies in Norwegian media, if very subtle. I hope we shall see an increasing number of MSM articles in the coming months, presenting alternative views to the IPCC doctrine. Confirmed. The term “ice storm” is unknown here. What effect will this have on the reliability of tree-ring/temperature proxy studies? “Climate histories are commonly reconstructed from a variety of sources, including ice cores, tree rings, and sediment. There are reasons to believe that tree ring data may not capture long-term climate changes (100+ years) because tree size, root/shoot ratio, genetic adaptation to climate, and forest density can all shift in response to prolonged climate changes, among other reasons (Broecker, 2001; Falcon-Lang, 2005; Loehle, 2004; Moberg et al., 2005). Most seriously, typical reconstructions assume that tree ring width responds linearly to temperature, but trees can respond in an inverse parabolic manner to temperature, with ring width rising with temperature to some optimal level, and then decreasing with further temperature increases (D’Arrigo et al., 2004; Kelly et al., 1994). This response is most likely due to water limitation at higher temperatures, because higher temperatures increase evaporation rates. The result of this violation of linearity is to introduce tremendous uncertainty or bias into any econstruction, particularly for temperatures outside the calibration range…”. “This is an easy mystery to solve. When a cosmic ray hits the atmosphere, it creates a shower of ionizing radiation, each of the secondary particles are enough to ionizing oxygen and nitrogen molecules in the atmosphere, forming nitrogen oxides, these react ready with water forming nitric acid, which will precipitate in dilute form in the rain. Only lightning and cosmic rays can form nitrogen oxide, and lightning is relatively rare, so the amount of available free nitrates in the soil, depends very much on the amount cosmic rays hitting the earth. Plants of course need nitrogen to grow, the trouble is they can’t absorb nitrogen from the atmosphere (except for Legumes (pea, and beans and similar plants)). So for the majority of plants and trees, not feed by human fertilizers, the amount of fertilizing nitrate available to them, is directly proportional the cosmic ray flux. The real significance would be that trees are better pluviometers than thermometers. That surely throws into question the calibration methods used in certain dendroclimatology studies. Papers such as this ask more questions then they answer,and for that reason they are important.as they allow one to look for definitive mechanisms on a number of levels ie from the macro to the molecular level. For example is it metrological with changes in diffuse radiaiton. Or alternatively as it is a plantation forest,is it an interaction with silviculture ie weeding etc eg. Many chemical and physical systems can occur in two forms distinguished solely by being mirror images of each other. This phenomenon, known as chirality, is important in biochemistry, where reactions involving chiral molecules often require the participation of one specific enantiomer (mirror image) of the two possible ones. In fact, terrestrial life utilizes only the L enantiomers of amino acids, a pattern that is known as the ‘homochirality of life’ and which has stimulated long-standing efforts to understand its origin1. Reactions can proceed enantioselectively if chiral reactants or catalysts are involved, or if some external chiral influence is present2. But because chiral reactants and catalysts themselves require an enantioselective production process, efforts to understand the homochirality of life have focused on external chiral influences. One such external influence is circularly polarized light, which can influence the chirality of photochemical reaction products2, 13, 14. Because natural optical activity, which occurs exclusively in media lacking mirror symmetry, and magnetic optical activity, which can occur in all media and is induced by longitudinal magnetic fields, both cause polarization rotation of light, the potential for magnetically induced enantioselectivity in chemical reactions has been investigated, but no convincing demonstrations of such an effect have been found2, 3, 4. Here we show experimentally that magnetochiral anisotropy—an effect linking chirality and magnetism5, 6, 7—can give rise to an enantiomeric excess in a photochemical reaction driven by unpolarized light in a parallel magnetic field, which suggests that this effect may have played a role in the origin of the homochirality of life. A short term temperature drop in a warm summer causes a jump in rainfall. Extended cooler conditions of a year or more will produce drought. The forcing factor is the solar wind variations driving the temperature changes, CR`s are merely a proxy for this. Wow, because we measured more GCRs tree growth is enhanced… or could it be that less UV is arriving presently, or more light diffusion which favors plant growth because all the crap in the air from coal and biofuel burning? But I give you that, the plants in my garden must have been waiting for those GCR’s during this solar minimum for they blossomed like never before, and presently even a second time this autumn… when it’s not so hot now. We had a tornado last week. Never seen one hitting land, but now it did. Several heavy and (we thought) healthy oaks keeled over the road, but it being a virtual dead end, barely traffic. Took a tree-ring sample. Rings indicating stagnation. Yes, soon I’m a dendroblogchronoloscientist too, with an plucked out of the air opinion. See I told you so… GCR’s promoting treegrowth… yeah right. The mystery is certainly not solved. In the first place plants get their nitrogen from nitrates that are produced by nitrogen fixing bacteria, not from nitric acid. In the second place, the number of cosmic rays reaching the lower atmosphere is too small to produce anything like enough nitric acid, assuming even that it could be used by plants. The increased cloud cover hypothesis sounds better, since it is already known that cloudy ambient light is better for tree growth than direct sunlight, and we already have a hypothesis describing cloud seeding by cosmic rays. Firstly, the Edinburgh University are to be commended for thinking outside the AGW box, and checking growth patterns with GCR, and then publishing their findings, even though they challenge the established orthodoxy, and possibly risk future funding. My second thought was have the researchers ensured that the trees were not fertilised at any time – which does happen occasionally in commercial spruuce forest plantations – usually by then use of helicopters to spray large areas. The Scottish climate does have a little variability, but there are never sustained periods of drought which could lead to water stress in trees, and likewise sunlight and temperatures don’t vary that much considering our close proximity to the Atlantic where 80% of our weather comes from. So to me, assuming that there was no use of artifiical fertilisers, the Slashdot explanation highglighted by Yarmy (02:05:49) does make a lot of sense. Also, just to confrim that ice storms events are extremely rare in Scotland, and nothing like the severity of those experienced in North America or the European Alps. Dr. Svalgaard has on numerous occasions pointed that TSI variability is negligible, and since correlation is stronger with CR than with any other pointer a new process has to be considered for increase in the photosynthesis. PS is a function of osmosis process in living cells. CR and Solar radiation may (through change of electrical conductivity within cells) affect concentration of minerals and osmosis process, reflected in the growth. Alternatively it may be something as simple as the small increase in UV putting a brake on proliferation of the leaf fungus. Aerosol particles affect the Earth’s radiative balance by directly scattering and absorbing solar radiation and, indirectly, through their activation into cloud droplets. Both effects are known with considerable uncertainty only, and translate into even bigger uncertainties in future climate predictions. More than a decade ago, variations in galactic cosmic rays were suggested to closely correlate with variations in atmospheric cloud cover and therefore constitute a driving force behind aerosol-cloud-climate interactions. Later, the enhancement of atmospheric aerosol particle formation by ions generated from cosmic rays was proposed as a physical mechanism explaining this correlation. Here, we report unique observations on atmospheric aerosol formation based on measurements at the SMEAR II station, Finland, over a solar cycle (years 1996–2008) that shed new light on these presumed relationships. Our analysis shows that none of the quantities related to aerosol formation correlates with the cosmic ray-induced ionisation intensity (CRII). We also examined the contribution of ions to new particle formation on the basis of novel ground-based and airborne observations. A consistent result is that ion-induced formation contributes typically less than 10% to the number of new particles, which would explain the missing correlation between CRII and aerosol formation. Our main conclusion is that galactic cosmic rays appear to play a minor role for atmospheric aerosol formation, and so for the connected aerosol-climate effects as well. Apologies if someone has mentioned this already (didn’t have time to read through al the comments this morning) but it seems to me that another aspect of more cosmic radiation would be fertilization. If the cosmic radiation ionizes N2O (given off naturally by nitrification and denitrification in soils) and forms nitrites/nitrates then the higher cloudiness leading to more rainfall would deliver this fertilizer to the trees. the difference between honest skeptics and snarky close minded warmists like you is so stark and profound. Mann’s bogus tree ring studies are a sham because tree rings are a lousy proxy for temperature (that plus data manipulation). that’s what the good faith skeptics have shown in this and other blogs. tree rings are however true analogs of tree growth; what is causing the growth rate differences? it’s not temperature, so that’s the question. go on, be a close minded snark, it’s probably the peak of your intellectual capacity. This is what I meant with my comment at 18:12:16, when I hypothesized that within a narrow temp band, you could have big tree ring growth benefits on cloudier, slightly cooler days, but in the long run, cloudy cold years and decades could have tree ring growth disbenefits. Re Yarmy (02:05:49) comment on possible nitrogen benefits from more GCRs, and subsequent comments suggesting that any such effect would be minor or non-existent. First, one effect that we are seeing the in US from the increased nitrogen oxides from more cars and power plants and such in the last half century is a nitrogen fertilization effect. Increased growth due to more nitrogen oxide emissions, some of which is converted to nitric acid and neutralized to nitrate, has been documented in forests and crops. But, the nitrogen oxide emissions also contribute to more ozone, the major reason EPA is taking steps to reduce nitrogen oxide emissions. While the cloudiness effect is likely the major reason for the growth spurts in tree rings in the last several decades, I would like to see some analysis which could quantify the amount of increased nitrate in the atmosphere when GCRs are more abundant. Right about now would be a good time to look. From the abstract: We discuss the hypotheses that might explain this correlation: the tendency of galactic cosmic radiation to produce cloud condensation nuclei, which in turn increases the diffuse component of solar radiation, and thus increases the photosynthesis of the forest canopy. What is such a diffuse component. If there are more clouds=more shade=less photosynthesis. It proves the contrary!. The key element in chlorophyll is magnesium, then if there is a magnesium increase there is an increase in photosynthesis and a deepening of the green color on plants´leaves. It could be many things. Great stuff – this is what I read WUWT for! – 55N 3W and the team’s location in Edinburgh probably puts us in the Southern Uplands of Scotland – has anyone actually seen the paper, is it more specific? – Rainfall is definitely *not* the limiting factor in that environment! – The environment is relatively warm for the latitude and we are nowhere near the Sitka’s northern limit, so I don’t think temperature would be limiting either. So the explanation that it is the effect of clouds on scattering rings true to me… Is this testable directly? Are there measurements of the ratio of direct and diffuse sunlight? Adolfo: The “diffuse component” is the blue-grey light you get from open sky/clouds as opposed to the direct (white/yellow) sunlight you get from the sun itself. As it gets cloudier the total amount received does indeed fall, but the amount received from the diffuse part *increases* because the clouds scatter the light that would have been direct for someone else (if that makes any sense!). As I wrote above, the geography and nature of the forest here lends good support to that explanation. you can see what I mean about density – and imagine where those trees get their light from when the sun angle is as low as 12 degrees. I wonder whether the rings can show whether the trees are more sensitive in the winter (or early and late in their growing season, if they go dormant), when diffuse light is more important? On chirality and polarisation, I make the obvious speculation that direct sunlight in high latitudes is heavily polarised, but cloud cover will diffuse the light and so depolarise it, and that may be why photosynthesis seems to be faster in cloudy conditions. Please don´t forget the rain. If clouds increase, rain increases. The Ae Forest is roughly near the ‘n’ of Drumlanrig, just north of Dumfries. Wrong again. GCR just happened to correlate with volcanic activity during this period. The idea that trees respond to solar cycles need not be derided here. It was the original intent of the science of tree rings. To be more exact, the scientists here need to show that these trees were not sensitive to moisture deprivation as a limiting factor to growth. WRT the high rainfall of the southern uplands. Consider that trees in a high rainfall area accustom themselves to such conditions – their root systems remaining moderate to small in size – whereupon a warmer, dryer year comes along. They “suffer” less growth in those years. Perhaps a trick of the light is part of the reason for the extra growth. During solar minima sunlight contains less harmful ultraviolet ray (UVC) which can damage some plants, so better growth when this happens. Paul, the pic you linked to in this post is interesting, all the foliage is in the top 1/3 of the trees. It’s almost a canopy in that pic. supercritical, Paul (06:43:16) also posted the link to the study linking CRs to increased cloud formation, which might have some climate impact if it can be confirmed. 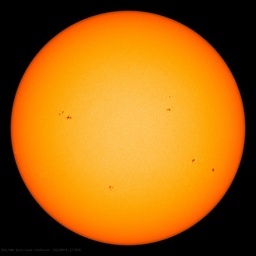 The sunspot-climate correlation doesn’t have much in the way of mechanisms to describe how it’s supposed to work, so it’s been hard to defend the assertion that the two are really related. But that study might be a step in that direction. Let’s not give too much credence to the authors’ basic finding. Note in particular that the correlation was weak, although significant. With this sort of data mining exercise, this admission should sound immediate warning bells. I don’t have access to the paper but it appears from the descriptions here and in their press release that several climate and non-climate variables were explored. The problem with this is that one of the variables has to come out to be top of the pops and the authors appear to admit there was no a priori reason for cosmic rays to be that one. In such circumstances the null hypothesis against which significance must be tested is not zero correlation but the population of maximum correlations among M uncorrelated trial variables with N years of record. This is a much higher bar to leap over than the basic one. For example, assuming a reasonable figure of 0.25 for the standard deviation of the basic correlation coefficient given the length of record, then the expected largest correlation coefficient from a set of 10 trial variables would be about 0.4 even if all 10 were actually uncorrelated. This is the baseline from which one must judge significance, not the zero correlation that is customarily assumed. So a correlation coefficient of 0.5 or 0.6 which one might think very secure from its remoteness to zero would be far from safe if proper allowance were made for the circumstances of the analysis. On a similar tache, without an a priori mechanism there is no reason to presuppose a postitive or a negative correlation, so did they use a two-tail test – most climatologists do not when they feel they are on the track of a real effect as it might spoil the story! Another concern relates to the “y” variable, the tree ring widths. The assumption underpinning such testing is that this is an objective and error-free quantity. But the authors admit to a usual decline with age and normally the annual ring width is expressed not in raw form but as a departure from a computed trend line. How this is done is itself a source of uncertainty and gobbles up degrees of freedom which should be reflected in the significance test. As I say, I have no access to the paper so the Edinburgh group may have got proper statistical advice that would warn them against reading too much into a marginal result. But from long and painful acquaintance with the statistical abuses of the research communities at the margins of climate and environment, I fear the worst. Now! now! As alluring as the results of this study are, let’s all be good little science-peoples. I am sure I heard some mention in recent years about correlation and causation? Actually I think we’ll need a stake for its heart, plenty of garlic and bright sunlight if we going to lay the hockey stick to rest. Well, this is huge then. If CR is a bigger impact than temp, all the treemometers are broken. Just a subjective observation or two. I’m an avid gardener, I love to grow veggies. When I grow tomatoes in the greenhouse I always paint the roof and the top line of the glass panes in the greenhouse walls with a whitewash type of stuff to stop direct sunlight on the growing tomato plants. This makes the plants grow straight up with a much lower tendency to put out axiliary shoots and it always results in a much heavier crop of fruit. I notice that commercial growers of tomatoes do the same thing. Potatoes, also a member of the Solanacea family like tomatoes, do better when the summer is cloudy. Too much sun gives long, lank haulms with fewer and smaller tubers. In Ireland, where much of the summer is overcast, potatoes do very well indeed: shorter, sturdier haulms and better tuber yields. It is a widely acknowledged fact here in the UK that, since the major decline in the use of coal to heat houses, there has now grown a necessity to spread sulphur on the ground in which certain crops are to be grown. This is to replace that sulphur which used to be had for free from the ‘polluting’ coal smoke. Another well-known gardener’s tip is to use Epsom Salts (magnesium sulphate) on green-leaf crops to increase yield. Everyone knows this — throwing this in peoples’ face does not advance the discussion. deciduous forest by 23% in 1992 and 8% in 1993 under cloudless conditions. cloudiness, particularly in the middle latitudes. Variations in cloudiness can influence the global carbon cycle, because clouds are effective producers of diffuse radiation and can also change many meteorological variables that affect plant activities. In other words, if Svensmark’s theory is correct, we don’t need a huge volcanic explosion to produce diffuse radiation to enhance plant growth, as all we need is a little more cloudiness caused by an increase in atmospheric aerosols production due to more cosmic rays reaching the Earth’s atmosphere. Another factor in this is forest density. Tree ring increase is a lateral increase in the size of a tree. Growth is three dimensional and in a crowded forest there is a race to the top of the canopy. Have a look at the commercial crowding in http://news.bbc.co.uk/earth/hi/earth_news/newsid_8311000/8311373.stm (middle photo) to see this effect where growth is directed vertically for commercial reasons at expense of lateral growth. Therefore forest crowding is another factor in tree ring width. Stephen Brown (above),interesting comments about greenhouse modification increasing the fruit bearing properties of tomatoes and potatoes. Our Tomato growing season in Canberra is short and one suggested method of bringing on the fruit rapidly is to pull the bush out of the ground and immediately replant it. This seems to shock the plant into thinking Armageddon has come,plant vegetative growth stops and all energy goes into the reproductive mode. I have suggested before that this cycle is enacted by all plants, with vegetative growth rate being restricted by the need to reproduce. Another tree ring size factor. It seems to me that what’s needed in this research area (and many others) are the equivalent of double blind medical studies. The trees should be selected at random, etc. Does anyone know if this philosophy has been discussed and/or formulated? The most probable reason efficiency ,where nature has around 2.7g/yr to evolve a very efficient mechanism fo energy transfer.At the molecular or quantum level this efficiency is close to 100%. in the light harvesting centers to the reaction centers a nm distance. In addition the changes or process are very fast in the region of picosecond so temperature has little difference at 77k or 300k in energy transfer . There is an interesting article here . Though it does look to be model based so GIGO rules could apply. Tree ring data from a single exotic tree plantation shows a very weak correlation with cosmic rays. Nope, can’t get too excited about that. Interesting to note, 15,000 years ago there were no trees in Scotland, nary a one. Trees wouldn’t grow there at all, due to the abundant ice. Whatever the recent microscopic perturbations in tree growth that researchers claim to have detected there, they are nothing compared to the massive vegetative changes of the aberrant Holocene. Thankfully, Most Scots are all PC-hot and PC-bothered that trees will grow at all in their country, since by all rights Mother Nature prefers that landscape to be frozen solid and devoid of life of any kind. I quite agree. We need massive global cooling to sterilize Scotland by freezing it solid in conformance with the Intent of Mother Nature, as best as we mere mortals can understand Her. Kumbaya. Quality control please. Has anybody here ever hear of autocorrelation? Or does that only matter if you don’t like the paper. Dengel et al. is a case study in what happens when you ignore autocorrelation. – Sitka spruce is a native to Alaska, so the cooler the better, the moister the better too, I guess. Also, if its raining its cloudy but it does not always rain when its cloudy….